Das 30-teilige Besteck-Set bietet Ihnen passend zu zahlreichen Speisen und Gängen je sechs Menuegabeln, -messer und -löffel sowie Kuchengabeln und Kaffeelöffel. Damit Sie das Set finden, das Ihren individuellen Wünschen entspricht, gibt es die WMF Bestecke in verschiedenen Designs. Die 30 Teile sind eine gute Basis für tägliches Speisen und können mit weiteren Servier- und Ergänzungsbestecken vervollständigt werden – für eine vollendete Tischkultur. Klassisch und edel wirkt das Besteck Kent. Die großzügig gestalteten Vorderteile bilden einen schönen Kontrast zum breit auslaufenden Stielende, das umlaufende Fadendekor trägt zur gelungenen Mischung aus Tradition und Moderne bei. Damit passt das polierte WMF Besteck gut zu verschiedensten Stilrichtungen. Mit seinen klassischen Proportionen liegt das Modell Kent zudem gut in der Hand. Das Menuebesteck lässt sich umfassend erweitern – so steht auch einer großen Tafel nichts im Wege. High-quality cutlery from WMF: always the right choice! Cutlery has been a feature in dining rooms ever since mankind stopped eating with his hands. WMF offers you quality cutlery in attractive designs that will last you a lifetime. Cutlery is one constant throughout all of our lives. First thing in the morning, you cut your bread roll with a knife and enjoy a nice cup of freshly-brewed tea stirred with a teaspoon. Then, at midday, maybe you eat some soup with a spoon and use a fork to put some crunchy salad in your mouth. Mid-afternoon is the perfect time to stop for a cup of coffee and cake, which you eat using a special little cake fork or other cutlery made for eating cake. And to complement your latte macchiato? Well, you need a latte macchiato spoon! Of course our cutlery sets include many more pieces, from ice cream spoons to espresso spoons. Cocktail spoons guarantee that things stay stylish. Some items make ideal additions to your existing cutlery set, for example a sugar spoon to go with the sugar bowl or a stewed fruit serving spoon so you don't have to dip your knife into the jam jar. Cutlery should always be of the highest possible quality. It should remain in use for many years and perhaps even be passed down to the next generation. 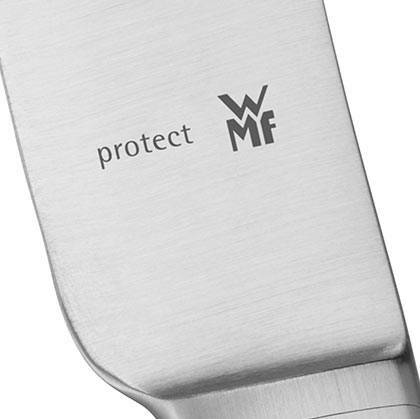 WMF cutlery has been specially designed to have a long lifespan. With our patented Cromargan protect® we are able to create cutlery with a level of quality never seen before and that impresses in every sense. Even after years of use, your cutlery looks almost as good as the day you bought it. WMF cutlery made from Cromargan protect® is dishwasher safe and rust-proof, impressively scratch resistant and shows almost no signs of wear and tear even with long and intensive use. Our cutlery made from Cromargan® 18/10 stainless steel is just as practical and when cared for properly can be enjoyed for many years. Our cutlery combines top quality with timeless elegance. Every item of cutlery has a pleasant and ergonomic feel to ensure perfect and harmonious handling. There are various collections to choose from for each type – so for every occasion you have the cutlery to match. 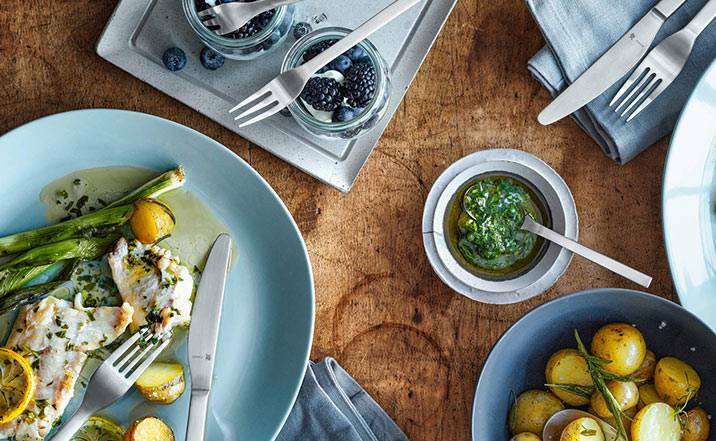 Our WMF cutlery is always there on every occasion, and makes dining a real pleasure. So explore the wide variety of cutlery at the WMF online shop today!